Thin flat surface for effective removal of plaque. Flossing is an important part of one's oral care regimen, allowing you to remove plaque and particles that can lead to tooth decay and gum disease from places between teeth that brushing can't reach. 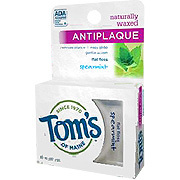 Our Natural Antiplaque Flat Floss is made of many strong nylon filaments woven together to prevent snapping or fraying. Prepared with a unique combination of natural waxes, our floss glides smoothly between teeth and is gentle on gums, and its flat shape and broader surface lets you clean each tooth efficiently and thoroughly. Grasp about 18" of floss between thumb and fingers of both hands. Gently work between each tooth to just below the gum line. Never snap the floss into the gums. Gently draw plaque away by sliding the taut floss against the surface of the tooth. Floss Anti-Plaque Flat Spearment is shipped in a discrete, unmarked package. Orders are processed immediately and usually take about 3 to 5 working days to be received. We do ask that you try it for 2 to 3 weeks to feel the full effects. Any information received is used only for order processing and shipping purposes. Your information, such as e-mail address, will never be disclosed to a third party.